December 2017 - Previous Photograph Competitions - Military Airshows. 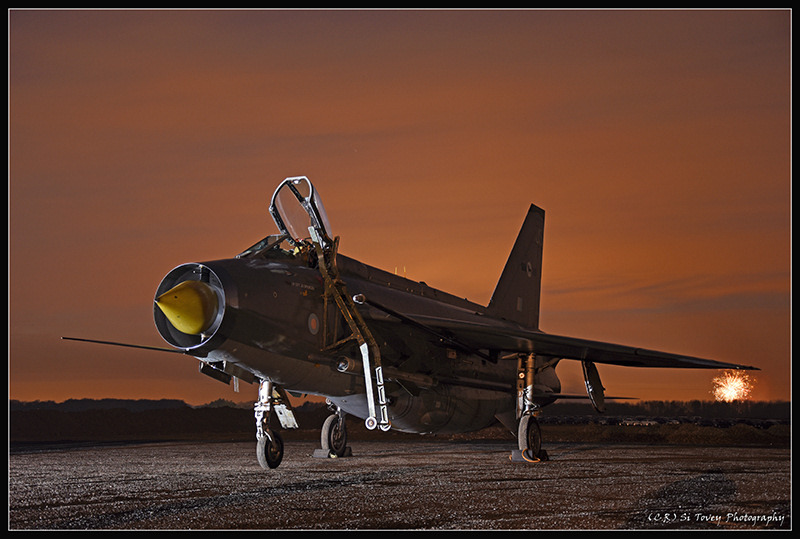 Twilight Lightning at Bruntingthorpe. Nikon D7200, Lens 18-105mm. North American P51-D Mustang "Jumpin' Jacques" at North Weald in June 2007. Nikon D70 18-70mm Nikkor zoom. Terry Crocker B-52 was taken at RIAT 2008, with my Canon EOS350D, and, I think, my Sigma 10-20 lens. Peter Busby Luftwaffe Tornado at RIAT 2012 with a Canon 50D and 17-85mm lens. BBMF Lancaster at the International Air Day, RNAS Yeovilton 2006. Nikon D50 with Nikon 18-55mm lens. Keith Griffiths Piaggio P.136 Royal Gull that is not exactly on the ground, but it is not flying. P.136-L1 N222A is seen at the seaplane base at Oshkosh during AirVenture 2008. Canon 10D and EF 100-400 lens at 250mm. Dean Alexander A Douglas Skyraider on show at Yeovilton 2012. I reverted it to mono and popped out the salient colours to make for a more interesting image. I thought the blade aspect & pattern would make for a good Image. Sony Alpha 300 & a 50mm Lens. D-9531, Dornier Do.31 E-3, photographed at Deutsches Flughafen Museum, Oberschleissheim, Munich on 5th May 2017. Andrew Ratcliffe RAF Typhoons representing six squadrons, displayed in numerical order. Taken at RAF Leuchars, Sept 2013. Hugh Valentine The Aircraft Restoration Company's Bristol Blenheim If - on the Flightline at IWM Duxford's Flying Legends 2017. Nikon D90.